The old aphorism “if you build it they will come” is a tired, and sadly, an untrue statement that so many new owners of businesses believe. It can be challenging trying to open up a restaurant, especially when there are other restaurants to compete with. Much goes into opening up a restaurant. It is salient for new business owners of restaurants to consider certain things when stepping into this business venture. For instance, the cost of running the restaurant, hiring the staff, buying the food and items and then there are taxes. Let’s not even get started with that. But more importantly, the most difficult challenge you will face, initially, is finding loyal customers. However, it is possible to grow a loyal customer base. Your restaurant’s style and aesthetics can be a huge factor in building a loyal customer following. To help you better understand this concept we have taken the liberty to compile a list of five creative ways to design your restaurant to not only bring customers but also keep customers. With these stunning, elegant, hip, stylish, sophisticated, classy, modernize, multicultural and any other positive adjective you can think of – you will discover smart investments more ways than one. 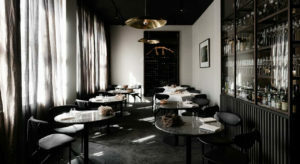 The Attica is a sophisticated restaurant that offers an air of class and elegance. The sophisticated ambiance that the Attica design provides the restaurant will significantly bolster the image and reputation of any restaurant. This is salient as reputation will be a huge factor in making your restaurant stand out. The world-renowned Designers, IF Architecture designed the Attica. The Attica steps away from many other restaurants in the visual department and gives customers and patrons a dramatic interior design that offers the essence of refined elegance. It very much is to the eyes what wine is to the taste buds. 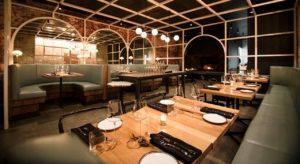 For restaurants owner who may be fond of the Eastern culture, specifically the Chinese culture, this design may very well be a restaurant model that significantly complements your restaurant model desires. The Chili Panda design offers a bit of the old Chinese restaurant aesthetic and adds a touch of Western-style modernity to it. Hence allowing for two cultures to blend seamlessly together to create a unique and captivating interior design. Designed by the Mata Design Studio – the Chili Panda restaurant design is excellent for coffee shop restaurants. Now, to transition over to a more adult-themed and design-oriented atmosphere. The La Trobe University design indeed is a brilliant model that promotes an atmosphere that emanates class, elegance, and a jazz-like tone. This restaurant model is not for your college kids but is more for those restaurants owners who want to open up a restaurant for your Friday night poets, writers, and artists. The designers of the La Trobe University are the highly reputable Studio 103. The name and style seem fitting for such a hip and cool restaurant model. Another adult-themed restaurant. The Neptune design offers a hip and down to earth atmosphere. 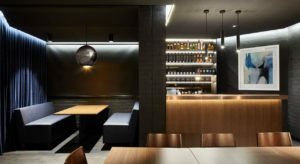 This acoustic paneling design is an excellent model for restaurant owners who are looking to create a restaurant where wine can be served. In addition, the classy look also blends with an urban background which creates a wholly unique design that is a model unto itself. Ewert Leaf Architect are the designers of the Neptune. If you are looking for a more city-esque design, this is the look for you. To step back over to the Eastern culture. The SO 9 is designed by Brandworks and takes its cues from the Vietnamese culture. 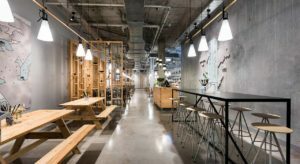 Like many of the additions in this listicle, but at the same time being unique unto itself, what makes this design stand out is that it blends two cultures together; the Vietnamese culture with the Scandinavian culture. 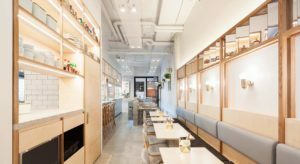 For our restaurant owners who are into bringing multiculturalism into their design, this may very well be the restaurant model that you may have been searching and pining after.